This is a simple throw everything in the oven salad recipe which works well as both a main or as a side. It is also great as part of a buffet. If you don’t eat fish, use boiled eggs, goats cheese or just some walnuts. Preheat the oven to 180*c. Peel and dice the beetroot into 2cm chunks. Place the beetroot in a roasting dish and toss with 1 tbsp olive oil. Season with salt & pepper. Cover with foil and roast in the oven for 45 minutes. If you are adding hard boiled eggs, boil the eggs for 8 minutes, then cool. 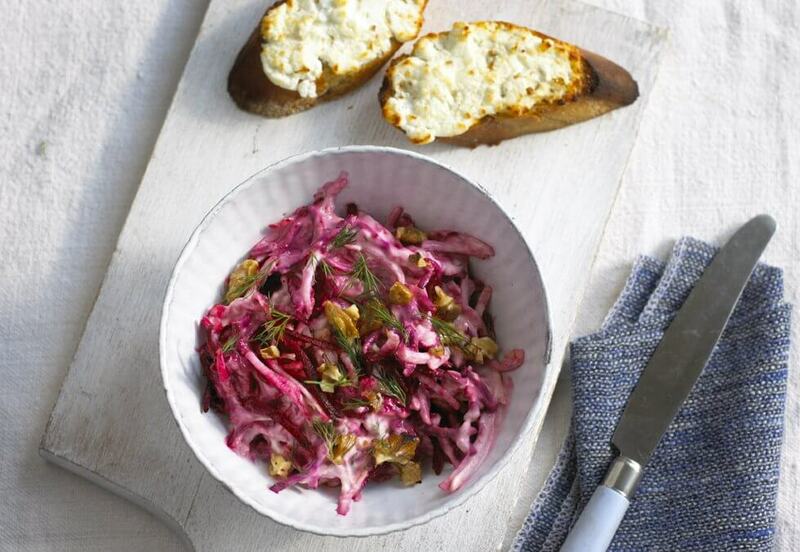 Once cooked, place the beetroot in a bowl and stir through the capers, dill and salad leaves. 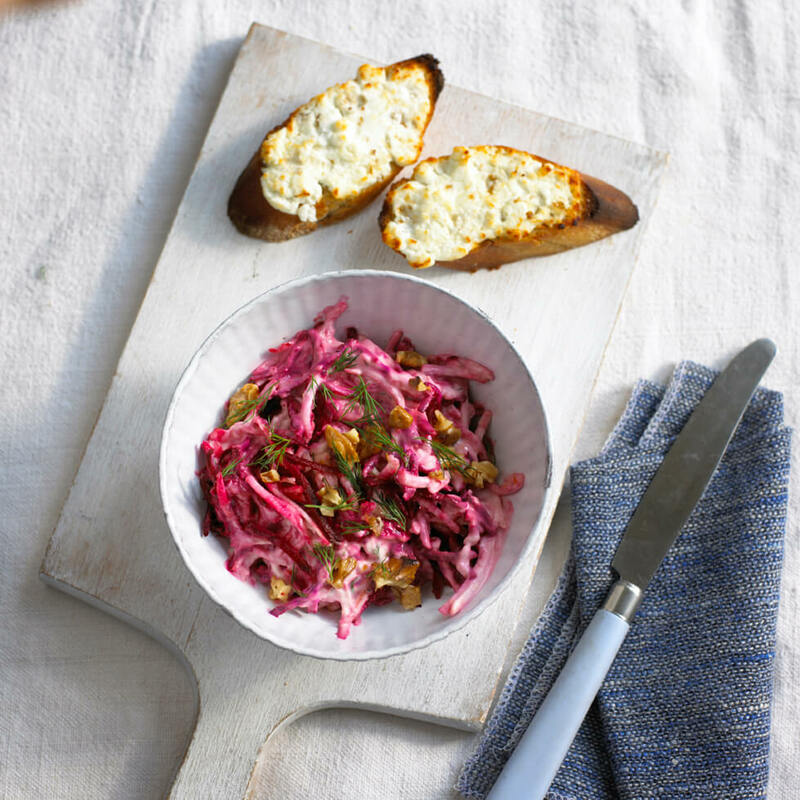 This recipe makes a delicious accompaniment to cold meats and cheeses, adds colour and flavour to salads (mix it with goats cheese, green leaves and walnuts) and is great with smoked salmon or trout for an easy starter. This recipe will make 2-3 jars of pickled beets. Trim and wash the beets but do not peel or chop them (otherwise their juices will be lost when they are cooked). Place them in a pan of cold water, bring to the boil and cook until tender (20-30 minutes, a sharp knife should easily be able to be inserted into the centre). While the beets are cooking, peel and thinly slice the shallots. Once the beets are cooked, scrape off the skins with a sharp knife (they should come off easily). Cut the beets intwedges or slices, or alternatively, if the beets are small leave them whole. Layer the beetroot and shallots in a sterilised jar. To make the pickling liquid, place all of the ingredients in a pan over a low heat until the sugar has dissolved. Once the sugar has dissolved, bring to mixture to the boil and simmer for 2 minutes. Pour the hot liquid into the jars, ensuring that the beets and shallots are completely covered. Top with olive oil and seal immediately. You can eat the beetroot immediately or keep them for up to a month in the fridge provided they are covered in the pickling liquid.